would also be awsome as a areal race track. 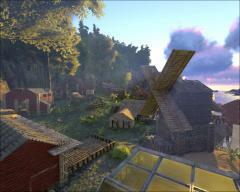 would be nice to have more dynamic building parts.like a rotar like part for the windmill so it could actually spin or to create a draw bridge like structure. sweet castle. would be nice if we could landscape our bases on official. What else counts as tames other than DINO and RAFT ?? i keep a different character on each server for that reason and transfer only when necessary .